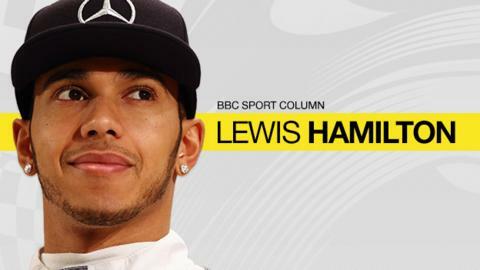 Live text and radio commentary via the BBC Sport website and app, plus qualifying and race highlights on BBC One. Full coverage details here. It feels great to be going into the Monaco Grand Prix weekend, one of my favourite races of the year, with an agreement to stay at Mercedes for another three years. Re-signing for Mercedes is what I always intended to do - and there was never really a doubt in my mind that I would. The media have been asking me all year why it has taken so long to sort it out, but it doesn't feel that way to me. My previous contract did not run out until the end of this season anyway and, although we intended to start talking about a new one in the middle of last year, in the end we did not get around to sitting down until February this year. When you consider I have been doing it all on my own for the first time, so I was learning all the way while trying to do due diligence and all the other things you need to get into with a contract, it feels like it has happened relatively quickly and smoothly. By the end of this new contract, which runs until the end of 2018, I will have been with Mercedes for more than 20 years, if you take into account the time I spent at McLaren before Formula 1, and in F1. At stages, there were potentially other options but I never even talked to anyone else. I have enjoyed my time at Mercedes so much so it was 1,000% in my mind that this is where I wanted to be, provided we could come to an agreement. I was led to believe from the beginning that Mercedes wanted me to stay - and it's always good when both parties are 100% committed to staying with each other. The Mercedes board members were very much instrumental in me getting my first drive in F1 with McLaren back in 2007, when they were Mercedes' works team, and we have had a great relationship ever since. As I now do with Mercedes motorsport boss Toto Wolff, executive director (technical) Paddy Lowe, who I've worked with for all my F1 career, and non-executive chairman Niki Lauda. All those relationships made negotiating interesting - it ensured it was completely positive, but of course it was also difficult. It's hard to talk about money with anyone, let alone someone with whom you have a really good relationship in lots of other ways as well. It's great we have the best car at the moment - as we did last year - but there are no guarantees it will stay that way in F1. I learned that at McLaren, and you only have to look at where Red Bull are now, compared to where they were from 2010-13. However, I feel that Mercedes have built a group of people who create an incredibly solid fortress, which does not even have a weak brick. It's not a case of knowing I will have a quick car. You can never know that. But I do know I have the best guys I could possibly have for whatever the rules throw up in the future. Monaco is one of the places where every driver wants to win. I have done once - back in 2008 - and I want so badly to repeat that this weekend. Whatever I feel about my abilities, somehow I have never executed a perfect weekend in Monaco. Even when I won I hit the wall early in the race, but thankfully was able to recover. Will I ever have one of those perfect weekends here? I don't know, but I am going to give it everything I have got over these next four days. A win in Monaco gives you the same 25 points as anywhere else, and the ultimate goal is to be world champion, but winning here somehow feels a bit more special than in many other places. I know I'm going to be asked a lot this weekend about last year and the controversy with my team-mate Nico Rosberg, but I don't have any feelings or negativity about that. I'm obviously aware of it, but it feels like a tiny thing in the past. I feel bigger than that. Of far more importance to me is that, in eight years in F1, I feel like I have never been good enough in Turn One (Sainte Devote), Turn 12 (Tabac) and Turn 18 (Rascasse). I am much more focused on - and annoyed about - that. In Monaco, everyone always wants to ask about the famous interview with Ayrton Senna in which he spoke of having a kind of out-of-body experience in the qualifying session here in 1988, when he was on pole 1.4 seconds faster than team-mate Alain Prost, and whether I've experienced something similar. Ayrton was a very special man and, after being in the business all this time, I also now realise he was a very smart man. Maybe he did feel that. From my point of view, I can't relate to it. When I'm driving, I'm very much in the car. It ain't an out-of-body experience. It is pure heart and driving for me. There is no doubt, though, that Monaco is the most intense experience of your career. It is so fast. The barriers are flashing past. By the time you're on full throttle, you're at the next corner already - sometimes even before. For much of the lap, you can't see the exit of the corner you're turning into. In your mind, there is a vision of where the limit is; how far you want to push. You're trying to get close to it, but you can't just hit it straight away because, if you go beyond, it means an accident. And that can sometimes wreck your whole weekend. In Ayrton's day, Monaco was different - they were changing gear with a stick and driving with one hand for much of the lap. But it is now several seconds faster than when Ayrton was driving, so your mind is having to take things in much quicker than they had to. Even in Formula Three, driving here is the greatest gift. To be one of the very few people who get to race on this amazing track in this beautiful place is a real privilege.